Mullberry picking in full swing. 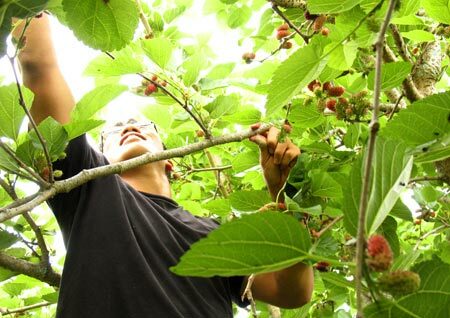 On a farm visit last Friday, I strolled past one of the mulberry trees and saw something going on. Human legs showing from under the full, leafy branches, and also the legs of a wooden step ladder. I circled around and saw packages of mulberries lying on the grass. The legs belonged to Pedro, the farm’s helper. Weber was perched on the ladder, searching for the darkest, sweetest fruit. I ducked under the branches and looked around. Weber, the new intern, was partly visible in the sea of leaves and branches. He was standing on the ladder reaching and picking fruit. “I’ve never seen a tree this full of fruit,” Weber told me. And it was true, every branch was loaded with ripe, ripening or still green berries. “The bees have been doing their job,” I told him. The tree is right by the hives and a flight path the bees take in and out of the hive area. They had done a thorough job of pollinating blossoms a few months before, and seems every one had set fruit. The berries don’t all ripen at once. 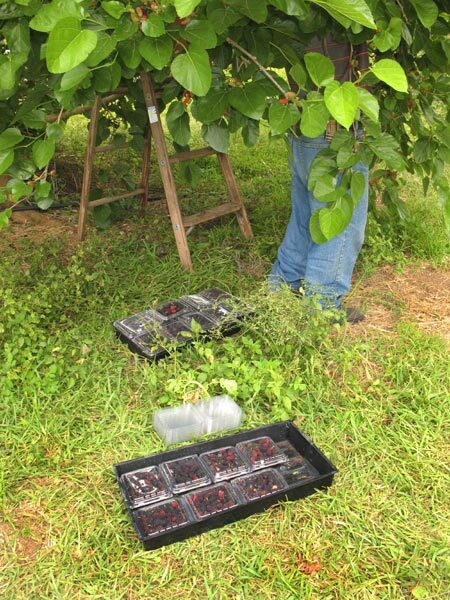 I offered to help pick, and scouted branches for the darkest, ripest fruit. They were deep purple and fell off into my hand at the slightest touch. The darker they are, the sweeter the flavor. 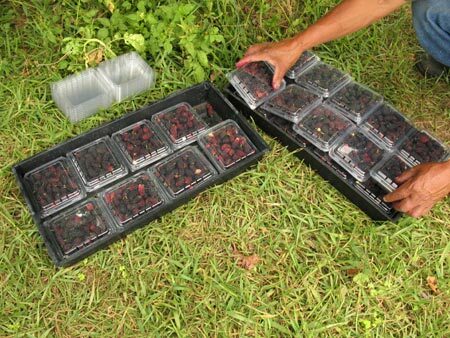 The thing with me and mulberries is that for every two that go into the box, at least one goes into my mouth! But don’t worry, I didn’t eat all of them. There’s plenty left. 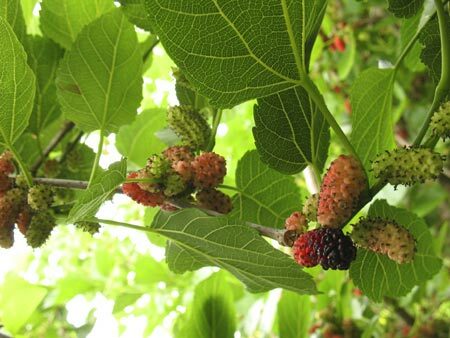 Look for ripe, juicy mulberries at market this Sunday and in the next week or so. But once they’re gone, they’re gone until next spring. Yes, Mulberries! I had some Saturday at Burr’s Berry Farm. I could eat about a million of them. Just delicious. It’s a wonderful time of the year to be visiting the Redland. our tree is in full bloom!!! and we are getting so many i think that i may be able to make some jam this year. so nice to other local trees! !